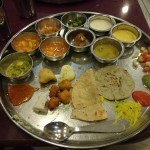 Gujarati Thali at Shree Thaker Bhojanalay ~ Yeh nahi khaya toh kya khaya ! Gujarati Sunday Vegetarian Thali at Shree Thaker Bhojanalay ~ “Yeh nahi khaya toh kya khaya !”…..it began serving 70 years ago in 1945 ! 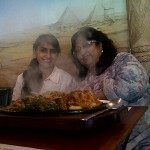 Overate the Gujarati Sunday Thali at Thaker Bhojnalay as always ~ cannot carry ourselves out ! 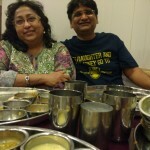 That’s a contented Wife & me waiting for our son and nephew to yet finish the Thali Meal at Thaker Bhojnalay ! 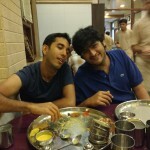 Nephew Kaizad & Son Varun yet wanting to eat more at Thaker Bhojnalay ! 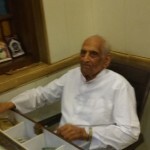 Owner of Thaker Bhojnalay ~94 year Old Maganbhai Purohit yet manages the Cash Counter ! 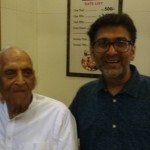 Just a few Sundays ago in October 2015 ,at the express desire of my adult nephew down from Toronto,my wife,adult son ,him and I sauntered in late afternoon at 2 pm to enjoy yet again a lovely Gujarati Thali at Kalbadevi’s (South Mumbai) legendary Shree Thaker Bhojanalay….it has no other branches….There were some large groups waiting as usual but as we were just four we got seating immediately…this is rare and possibly the rush was less because it was a really record hot Sunday and India was playing South Africa in a day night decider fifth ODI at Wankhede Stadium nearby so South Mumbaikars probably had stayed home…thankfully for us to get a place ! 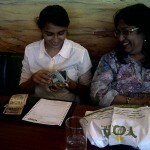 And Boy did we enjoy !….they keep serving faster than you can eat !….and do eat with your hands to relish it more ! 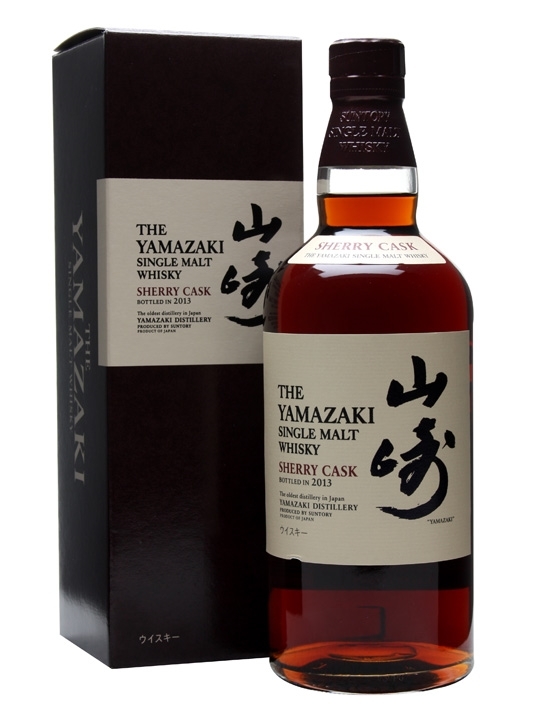 Japanese Single Malt Whisky rated the Best in the World !….Scotland ? First Thought was a Chuckle really that this must be the El Nino Climate Change Effect ! The Bottle costs Sterling Pounds 101.28 online at www.masterofmalt.com and it’s Sold out ! Want a Peg ! ? Posted in Chuckle !, Food Cuisines, Inspiring and Motivating, Interesting News Sightings, Investing Approaches, Investing Themes, Reflections, VALUATION	Tagged Japanese Single Malt Whisky rated the Best in the World !....Scotland ? 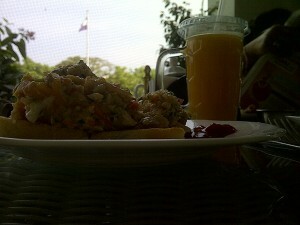 Feeling Warm ~ Daughter gives us a First Lunch Treat ! Our Eyes are already Moist!